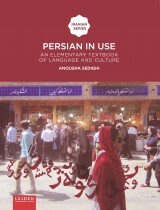 Anousha Sedighi has launched a fabulous website to accompany her textbook Persian in Use. Persian in use is an elementary Persian language and culture textbook designed for first-year Persian language students at college level. It offers a thematically organized and integrative approach to help students achieve proficiency in Persian language and culture. Amongst other things the website www.persianinuse.com offers sample lessons, quizlets and an instructor’s corner. Teachers of Persian can apply for the table of content and a complete chapter (Lesson 5) by sending an email to marketing@lup.nl. To order the book click here.